Los Angeles pedestrians may finally see some relief from citations. City Councilmember Jose Huizar and State Assemblymember Miguel Santiago are pushing for common sense changes to antiquated state laws in order to allow pedestrians to begin crossing the street during the flashing countdown signal. 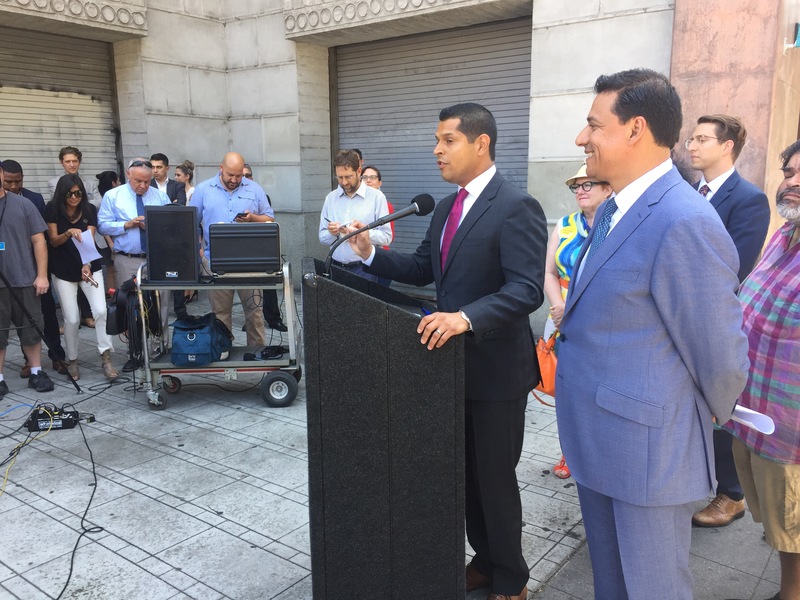 Huizar and Santiago held an action on August 9th calling for the adoption of AB390, which would put an end to these citations for pedestrians. In 2008, LA started using cross walk signals that included a count down to let pedestrians know exactly how long they had to safely cross. But as the state law currently stands, pedestrians can be fined over $200 for stepping off the curb during the flashing countdown. And most people don’t even know that that is illegal. LAPD currently does jaywalking stings in downtown and other parts of LA to capitalize on the ignorance of pedestrians. State Assemblymember Miguel Santiago (left) and LA City Councilmember (right) announce their support for AB390, which would improve a state law which allows police to ticket pedestrians who cross during the flashing countdown. “We should not be filling city coffers by doing ‘gotcha’ laws that attack pedestrians when they think they are doing the right thing and it is safe,” said Santiago. Cheers to Jose Huizar and Miguel Santiago for standing up for the pedestrians of Los Angeles! The jaywalking tickets that are doled out in DTLA are absolutely absurd. Cars break traffic laws in ways that put pedestrians in harms way, like blocking cross walks and running red lights, but I have never heard of a sting to ticket those drivers. It’s time to end the City’s picking of this low-hanging fruit, and for law enforcement resources to be devoted to punishing those who create unsafe situations on the road.